Shree Maa’s cooking is sublime, her recipes are extensions of her pujas. This cookbook applies simple dishes with traditional eloquence. A delectable vegetarian selection along with the mantras for preparation and offering the food before it is served. Such a sweet and wonderful cook book. I bought multiple copies to share with my sisters and they all love it!!! I happened to chance upon this book at a friends house and decided to get my own copy. I love the desserts! Indian cooking never seemed so simple! 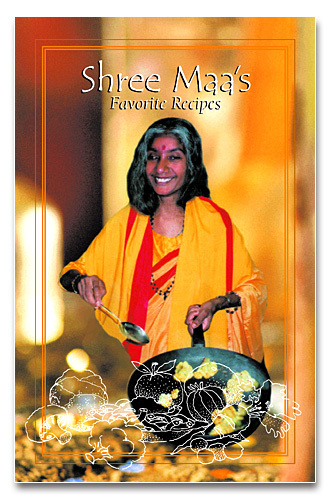 Shree Maa is an amazing cook and this cook book teaches us to become amazing cooks too. I am really struck by how easy the dishes are to make and how wonderfully delicious they turn out! I tried the cauliflower dish last night and had the entire family asking for seconds and thirds and fourths. What an elegant combination of Indian and International cuisine? Is there a sequel in the works?